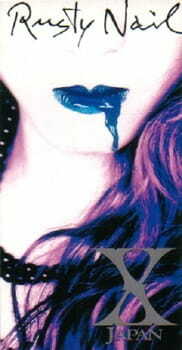 Rusty Nail is a X Japan's anime music video produced by CLAMP and included on VHS as a first press bonus for the "PERFECT BEST' compilation album, released in 1999. The video shows anime versions of the band: YOSHIKI, ToshI, hide, PATA and HEATH in a sci-fi like scenario. Music video genre: Pop, Heavy Rock/slow rock in some parts. The words are fairly cryptic. Making it hard to piece together what is being mentioned. My understanding is an artistic display of struggling with painful memories. We all have our own ‘Rusty Nails’ in our lives that we tend to keep buried for not to harm ourselves. Although like any good psychiatrist will tell you that is not a wise idea for it will only bring more pain overtime. Similar to actually having a nail rust inside your body. As for the conclusion where the moral of the story tends to kick was the best part of the anime. Here the majority of the action comes together. Also, where enemies don’t become enemies. Where the metaphoric expressions dissolve into slightly more obvious mentions. A truly emotional piece that does require a lot of revisits and heavy understanding. Much like the video of the characters. Some of which are drained or blinded but by opening up they are allowed to see what they have been missing out or have forgotten. That being the said the moral I say is to never forget but to embrace your fears. Art work was amazing. I say that for you may recall me stating earlier the words were cryptic. Which was quite true. With no other reviews and no insight information to this anime the words along with the art was all I had to piece together the puzzle of a plot. Given the amount of insight I could provide you about the plot goes to show how meaningful and captivating each artistic moment was. Perhaps, that was the point for making the words not simple so one could better appreciate the art behind the piece. If that was the case (clap clap) well done.